Abstract: LG has cooperated with Airwheel Technology which is specialized in electric scooters showing up at an activity in Uruguay lately. It's a brilliant strategy for both companies' market promotion. LG, a Korean Electronics Group leading world's industrial development has chosen Airwheel Technology to be its cooperative partner together showing up at an activity in Uruguay lately. With regard to cooperation between businesses, there must be some commercial reasons. 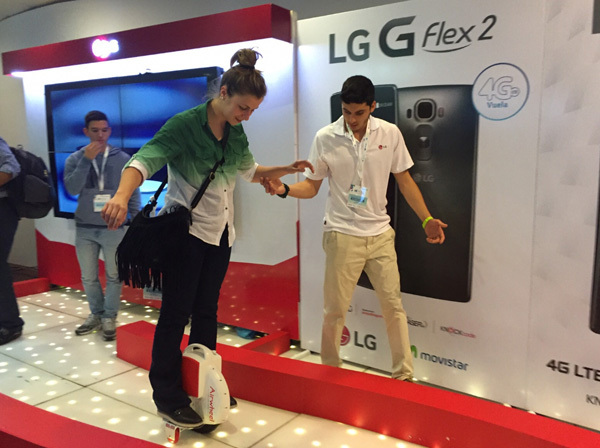 That is Airwheel Technology with its innovative products capable to attract more potential customers for LG. Meanwhile, Airwheel Technology can also show off its fine electric scooters in light of this platform. Her pose on the X3 is proper to keep balance. She can let go of the trainer's hand to stretch out her hands to maintain the balance on the unicycle. From her facial expression, she is enjoyable in the riding of X3. Anyway she is great to challenge electric unicycle as a graceful lady. On the other hand, there are also some two-wheeled electric scooters with better operation model like Airwheel S3, S5 and A3. The big advantage is the handlebar and two wheels, which makes users easier to keep balance when two feet step on the footboard. With a handlebar, the steering directions can be achieved by rotating it and body movements. Self-balancing two-wheel scooter S3 with 2 large knobby tires is quite stunning among these scooters. On the surface of the handlebar and fenders, there are coating decals. After this decoration, this scooter turns blinding. So it's easy to be noticed by others during the ride. However, Airwheel A3 sitting posture self-balancing scooter has another strength that other two-wheel scooters can't own. It is equipped with a leather seat with lower handlebar. Thus, it can be labor-saving when users ride it. 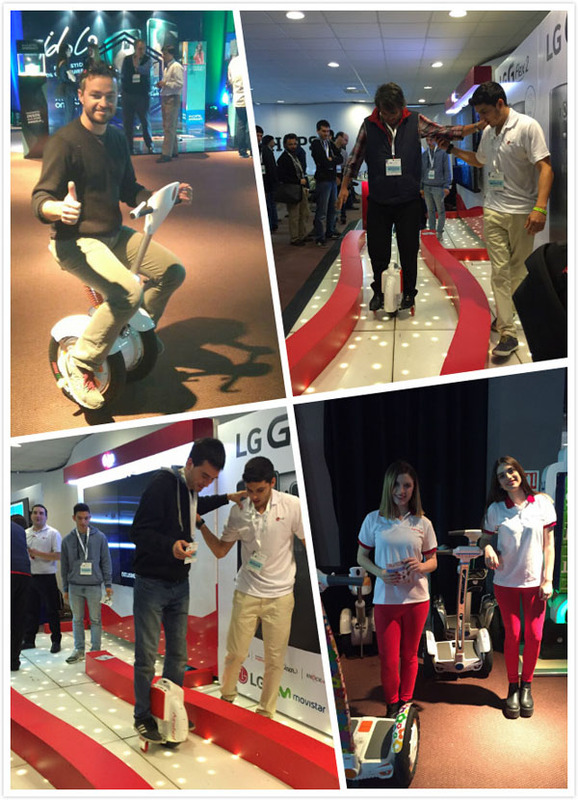 These products showcased by Airwheel Technology are really fantastic and can draw more visitors to LG. It's a good business strategy for both companies.